'A compelling blend of historical grit and supernatural twists' Daily Mail on The Falcons of Fire and Ice Vincent is an apprentice librarian who stumbles upon a secret powerful enough to destroy his master. With the foolish arrogance of youth, he attempts blackmail but the attempt fails and Vincent finds himself on the run and in possession of an intricately carved silver raven's head. Any attempt to sell the head fails ... until Vincent tries to palm it off on the intimidating Lord Sylvain - unbeknown to Vincent, a powerful Alchemist with an all-consuming quest. Once more Vincent's life is in danger because Sylvain and his neighbours, the menacing White Canons, consider him a predestined sacrifice in their shocking experiment. 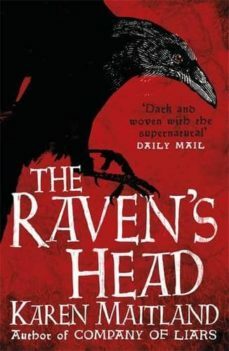 Chilling and with compelling hints of the supernatural, The Raven's Head is a triumph for Karen Maitland, Queen of the Dark Ages.